I don’t know about your family, but here? I have trouble keeping ranch dressing on hand. The Monkey Child and Mr. Six Dollar eat it with everything from carrots to pizza and even fries. When I realized that it was costing me probably close to $20.00 a month (i,e 5-6 bottles a month…I told you, they eat it on EVERYTHING), I knew I had to do something to save my grocery budget! For me, that means learning to make something myself versus continuing to buy it. That’s where this Homemade Buttermilk Ranch Dressing comes into play. Ranch dressing is one of those things that is either an epic fail or a huge success. There is a right or wrong with it, but this recipe? It’s perfect! 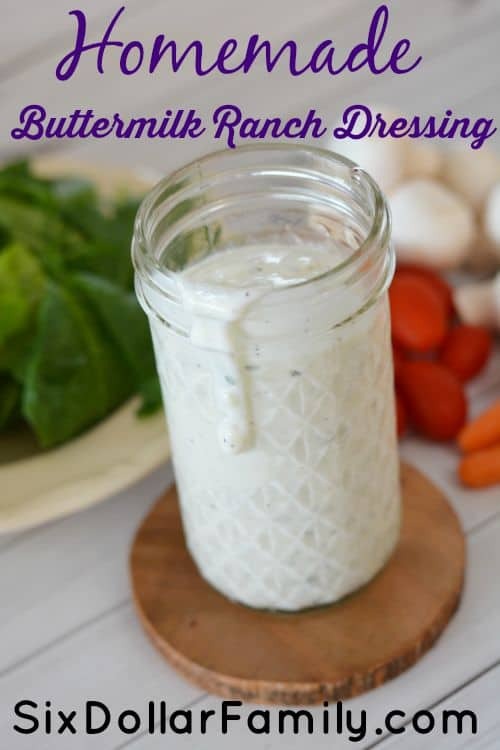 It’s creamy, not too sour (because ranch can be sour if the recipe isn’t quite right) and goes well with anything that you use store bought ranch on. The best part though is that it will save you money and help keep your family healthier than an expensive bottle filled what who knows what. 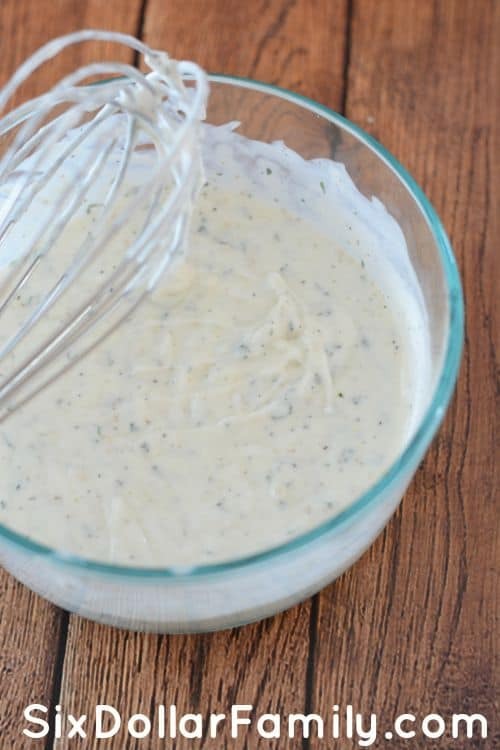 Keep in mind that since this is homemade, this buttermilk ranch recipe won’t keep as long as the ranch that you buy in the store does. It doesn’t have any preservatives so you should store any leftovers in an airtight container in the fridge for around a week. The great thing about it though is that it really is super simple to make so it makes it very easily to whip up on the fly as you need it. In a small mixing bowl combine all of the ingredients and whisk until well combined. 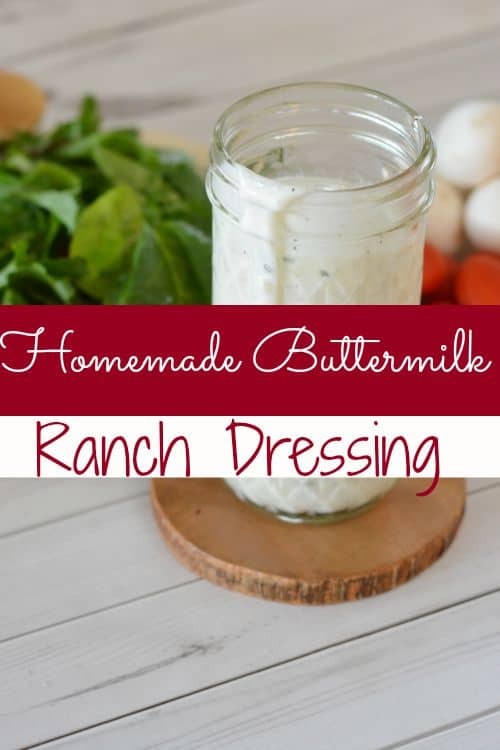 If you don’t have actual buttermilk, you can sour 1 cup of milk with 1-2 tablespoons of white vinegar to create a substitute, but keep in mind that this will change the taste of the dressing. After you have whisked everything together well, it will have a consistency that will remind you of veggie dip. If that is what you’re going for, stop here and chill for an hour before serving. 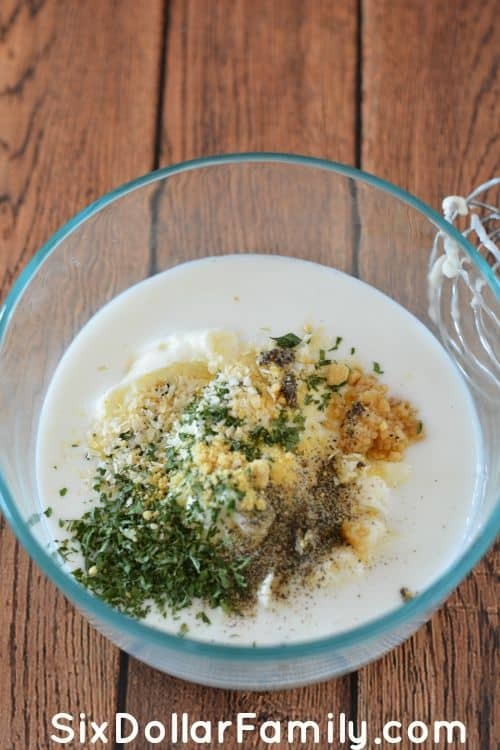 If however you want a thinner consistency for salads or dipping, add an additional 1/4-1/2 cup of buttermilk and mix well until you find the consistency that you’re going for. Chill for an hour before serving and enjoy!